On August 14, 2017 the Board of Commissioners (Taylor, Ross, Urban, Melton, Higdon, Miller, and Whitley) unanimously approved rezoning application 2017-661, submitted by Land Investment Resources, LLC. 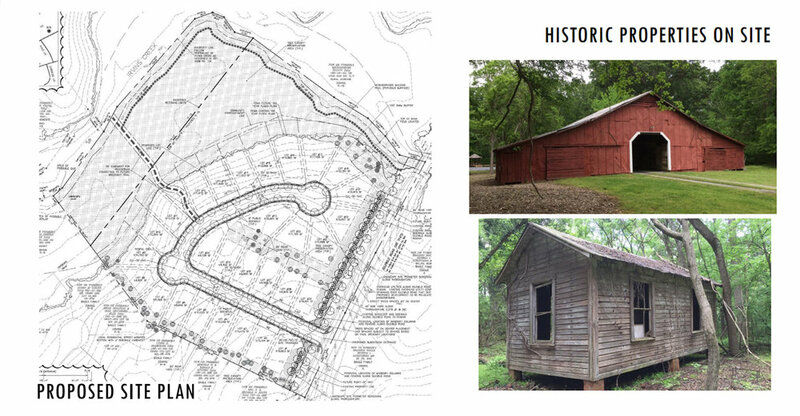 The property, 16 acres, at 10816 Idlewild Road (Tax Parcel 193-161-10) was rezoned from R-15 to R-15 & R-VS.
On the property at the time of sale was a single family home built in 1978, several outbuildings (a washroom which appeared to be late 19th or early 20th century) and a barn built in the early 20th century. The R-VS rezoning permits a maximum of 29 single-family detached homes, at least eight of which will have side garages. The property is within Crown Point Elementary, Mint Hill Middle, and Butler High School zones. The staff report to the Board presented no data for impact to those schools. The R-VS District requires a minimum of 8% tree canopy preservation. This proposed development would achieve 25% canopy preservation with a commitment to save the tree line along Idlewild Road. The buildable area consists of 13 usable acres and three additional acres along the Irvins Creek floodplain (and the future Irvins Creek Greenway). During the rezoning process, there were several points where Commissioner John Higdon led the conversation toward saving the historic buildings. The washroom was relocated to Purser-Hulsey Park Community Garden. With no feasible solution for saving the barn structure, Land Investment Resources, LLC offered to donate the materials to the Town for reuse elsewhere. The Town agreed. A subcontractor is currently disassembling the barn. The Town will store the wood planks until a suitable use arises, most likely at Purser-Hulsey Park.